Successfully Added GO Media HD - Worlds Smallest HD Media Player (Micro SD) to your Shopping Cart. 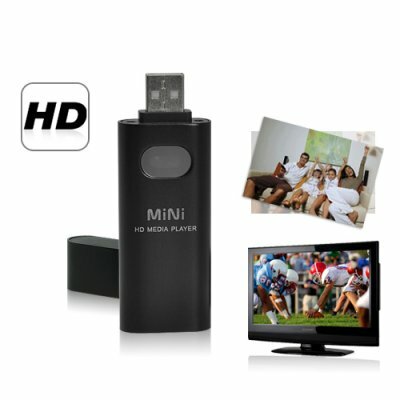 Enjoy amazing HD video wherever your travels take you with the world’s smallest HD media player. The GO Media HD player provides the most simple and convenient way to enjoy all your HD media while on the go. Measuring in at only 82mm long and 15mm thick, this miniature media player is small enough to fit in any jean pocket or purse with ease. The GO Media HD supports all of the most popular file formats used today. This includes: MP3, WMA, ACC, FLAC, MID, OGG, WAV, RMVB, 3GP, DAT, AVI, DIVX, FLV, MKV, MPEG4, RM, and VOB! Simply put, with the GO Media HD you can spend less time dealing with file compatibility issues and more time enjoying your multimedia content. You have downloaded thousands of video, music, and photo files to your computer. Instead of watching them on your computer monitor, now you can simply transfer them to the internal 2GB memory or micro SD card and enjoy them on your big screen HDTV. Setup takes less than a minute and it works with any HDTV by using the composite IN video connection. Beautiful HD output, solid aluminum construction, ultimate in portability and factory direct price make the GO Media HD the ultimate entertainment solution for people on the go. Order yours now while supplies last and we will send your new Mini HD media player out with 24 hours and even back the GO Media HD with our full 1 year warranty. Does this Mini HD Player support 1080p resolution? This HD Media Player will play 1080p video files by downscaling them to 720p.